Are you tired of wasting your valuable time searching high and low for the weather lessons you need for your upper elementary students? There are so many weather activities all over Pinterest, but we find most of the weather lessons are for preschoolers- not exactly what our students need. We focus on creating materials for teachers who teach the same things to the same age we do. Most of what we create comes from not being able to find what we need. 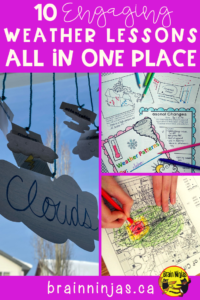 Weather worksheets are just plain boring and not at all aligned with our teaching style, so we’ve created weather experiments and activities that we use in our classroom. We want to help you by putting everything in one place so you don’t have to use all your time collecting lessons from all over the place.